Dubai a place where a building from drawing board to construction can happen in less than 48 hours has set its eyes on a climate-controlled city. 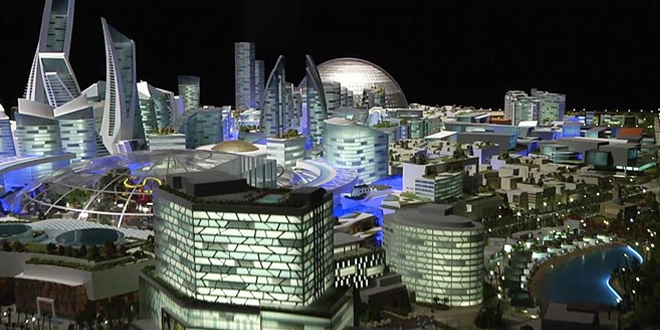 Prototype of the city has been is shown in the video at the top. World’s first climate-controlled city, Mall of the World is to be built in Dubai. The city should just be a big mall and it has been rightly named as Mall of the World. It will sit on a 48 million square feet area and will be the first city-sized enclosure that will allow its residents to completely avoid natural weather conditions. Although the idea of such a massive enclosure might seem off-putting some, because of Dubai’s extreme summer temperatures, which average 104 degrees, the temperature-controlled environment could become the region’s most popular destination. During Dubai’s winter months, when temperatures average 73 degrees, the city’s enclosed promenades will be opened to allow in the fresh air. Included in the city will be 100 hotels and luxury apartments, a “wellness district” designed to attract medical tourists (an increasingly important aspect of Dubai’s business development) and what the project’s developers expect to be the largest theme park in the world. Accompanying the announcement of the project, the developer also unveiled a slick teaser video (see above) showing off the design of the climate-controlled city, a futuristic set of images that bear a striking similarity to the kind of science fictional enclosed cities depicted in films like Logan’s Run. The company hasn’t revealed how much the project will cost, nor when it will be completed, but given Dubai’s history of successfully completing similarly ambitious development undertakings, there’s little doubt about the viability of the project. Cool isn’t it Dubai is taking the first step towards a modernized-future city. What do you think about Dubai’s initiative, let us know in the comments below. Previous: Jessica Simpson and Eric Johnson are Married! The Kathuria crime clan and Devhyani can have apartments within. All the non divine, the peasants, not elite and uber-wealthy upper echelon 1% top earners can rot without and no need to mingle! No need for the India elite to provide sanitation and toilets for the many. Seriously, it looks to clinical and way to creepy, like a facility or institution. Will they need a slide pass, or a minimum bank balance to enter this magnanimous retreat?